Yes figs are perfectly suited to growing in pots, the container will keep the plant nice and compact, plant into a good quality potting mix. 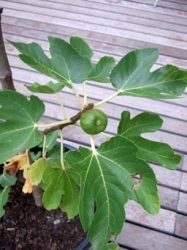 You will need to fertilize it regularly during the growing season with a balanced NPK fertilizer and repot every couple of years into fresh potting mix, do this in the winter when the tree is dormant and give the roots a prune when you repot. 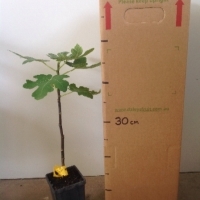 It is approximately 60cm tall when we sell them as can be seen here: http://plant.daleysfruit.com.au/trees/m/Fig-Black-Genoa-2393.jpeg and will grow between 2-4 meters. It Fruits between February and March and costs $24.90. 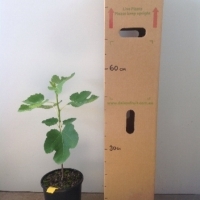 To find out how much freight will cost to your address please visit http://www.daleysfruit.com.au/Freight-Special.php and enter your postcode. 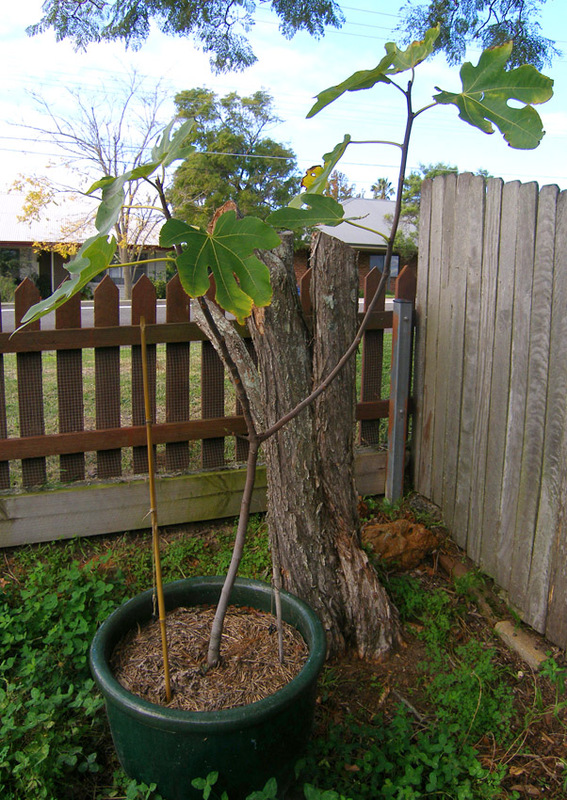 2009: All of my figs have grown from cuttings from my old tree which was one of a very few trees I had to leave behind at my old house. A friend taught me the trick - you crush the bottom 30% of the cutting with a rock and you get a MUCH better striking rate. 2010: The Genoas are crazy and even though it is winter and the other types are losing their leaves the Genoas are putting on new growth. Autumn 2011: They never did lose their leaves last year and I am sure that some of the leaves they have now are the same ones! AND they do not look like they are intending to lose them this year either. 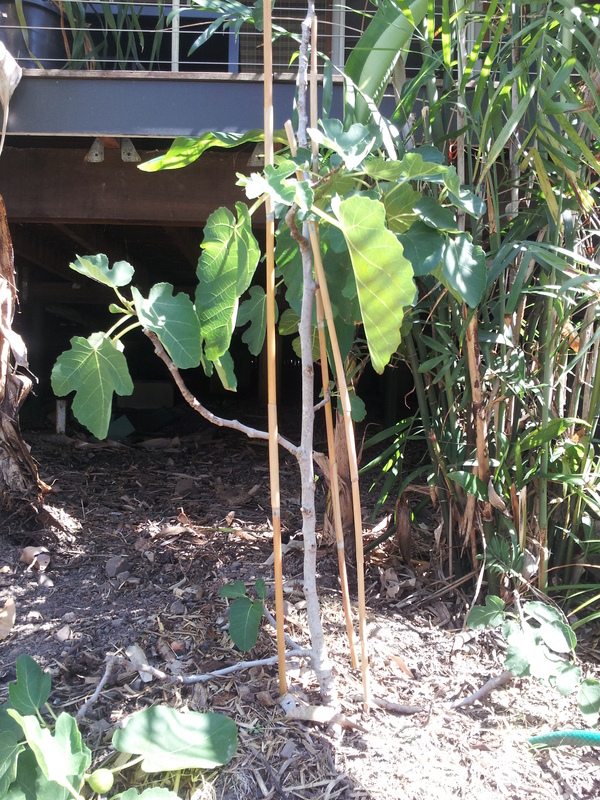 Summer 2011: With the cold and rain the figs aren't too happy. They also were copping mealy bug and stupid fig leaf curl bug. RAR! Not happy. Was forced to resort to Confidor. I hate to do it but they were is too much pain. 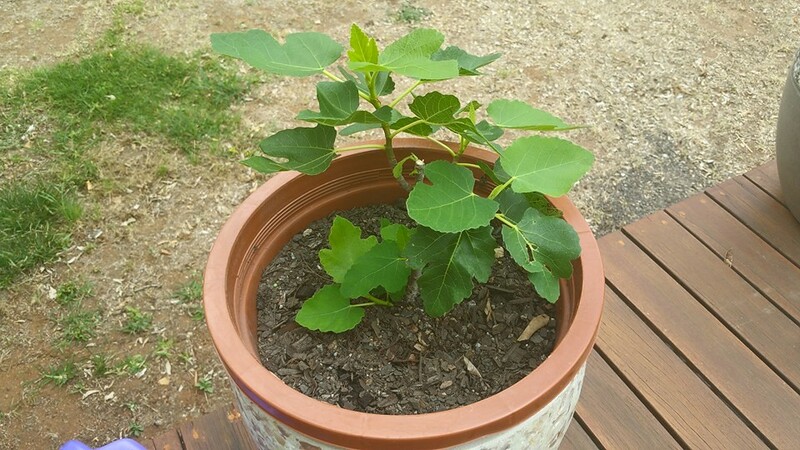 Planted into a grow bag and to be espaliered against a west facing wall. 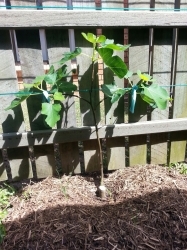 It was very small when I bought it and it has now trippled in size and had 2 fruit last year. I noticed yesterday that there is fruit buds setting. 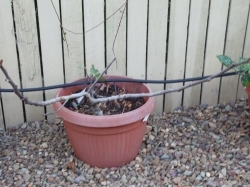 I prune to shape. Spring 2011- growing very well. I repotted in winter into a trough. 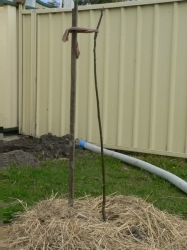 Its doubled in height but no fruit yet. I just bought one of these; it is still a baby but good to know that you are getting fruit. There's hope. 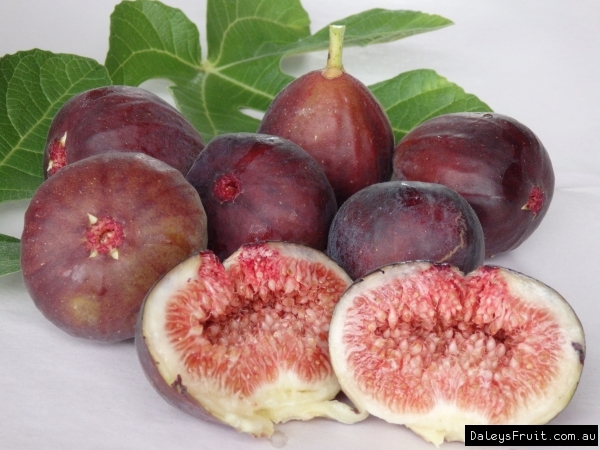 Comments: - Such a hardy fig, that makes a beautiful fresh fruit. I don't waste these ones on grilling/baking :) They are best eaten plucked fresh from the tree! 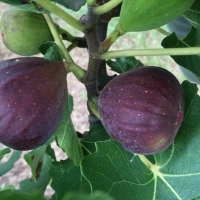 They are the first EVER fruits I have grown, I am very proud of them! I do strugle with rust on the leaves, what would be the best treatment for that? 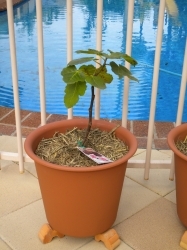 Grows very well in pot. Only planted in 2008 in a 50x50cm pot (keeps them dwarfed- and there's no more room in the ground). 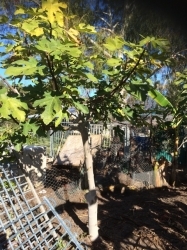 I love this fig as I planted 5, 2 x Black Genoa, 2 x Brown Turkey and 1x white Adriatic which I purchased from you in 2008 to surprise my Husband who was recovering from his first stroke. They have all fruited and grown from small plants to over 3m high and ready for this season's fruit. Can't wait!!! The taste is... to die for, soft and delicious. If you have only tasted the dried ones be ready for an explosion in your mouth! They all taste fantastic, not too fussed about the white adriatic though, maybe we are spoilt by the other 4 trees. I never thought after 1 year they would fruit to the capacity they did, maybe it's the constant talking and nurturing they receive. never sprayed, or touched with any pesticides, just love. 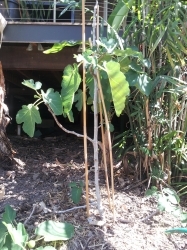 I would now like to espillair them, I know I have left it a little too late but can I trim them back to ground level or just trim the larger branches??? Shown is a new black Genoa fig from Daley's. It's the third one I've bought - i was really happy with the first one which starting pumping out fruit just months after it arrived. About 6 fruits on a tree stem totalling only about 8 inches long! I never use pesticides, rather pick bugs off by hand or try to companion grow. Yum! 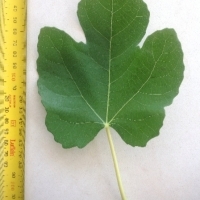 What a plant. Needs lots of water in the warmer months and the application of pyrethrum and garlic prevents caterpillars from eating the leaves off. Fruit is very good; sweet and juicy. Size up around 100 grams which is pretty large. 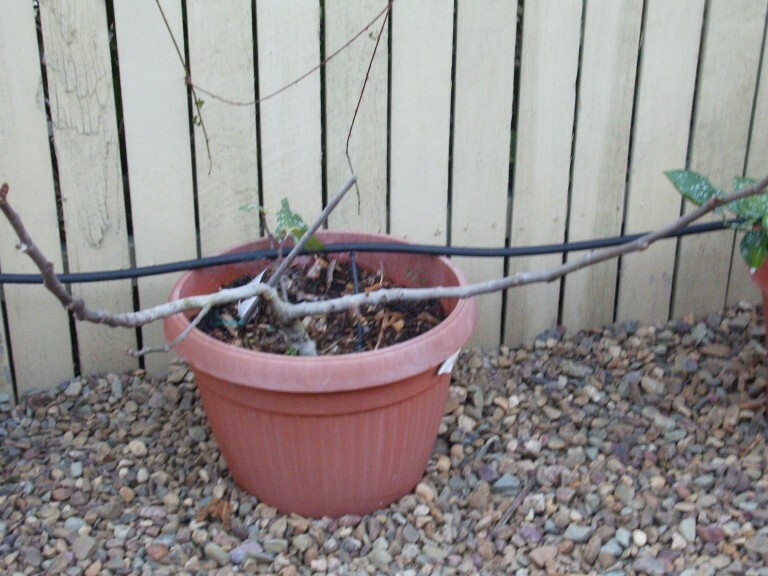 Mine (and my father's) suffered last season and didn't produce much fruit and what was there was dry. Just a bad season I guess. Season before that the trees were loaded. 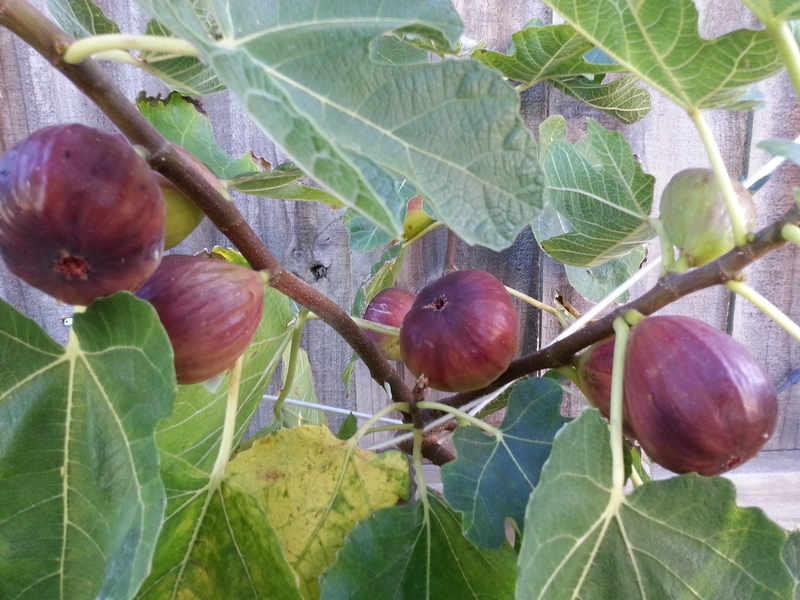 Fresh fig are so good! They will fruit all year round but spring summer fruit are best. 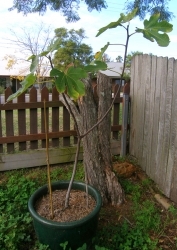 My tree has been pruned to give a central trunk and allow above groung branches. 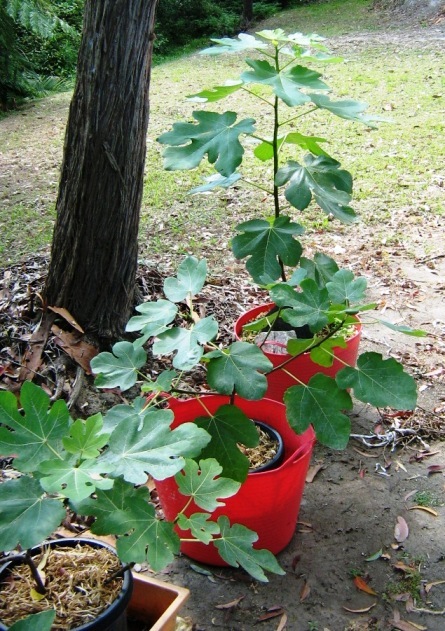 It was formed as a central trunk with 4 surrounding grounded branched before. This made it difficult to support and it broke often. Comments: - Beautiful large fruits when fresh and when dry is sweet and sticky. Large crop on a very small tree. 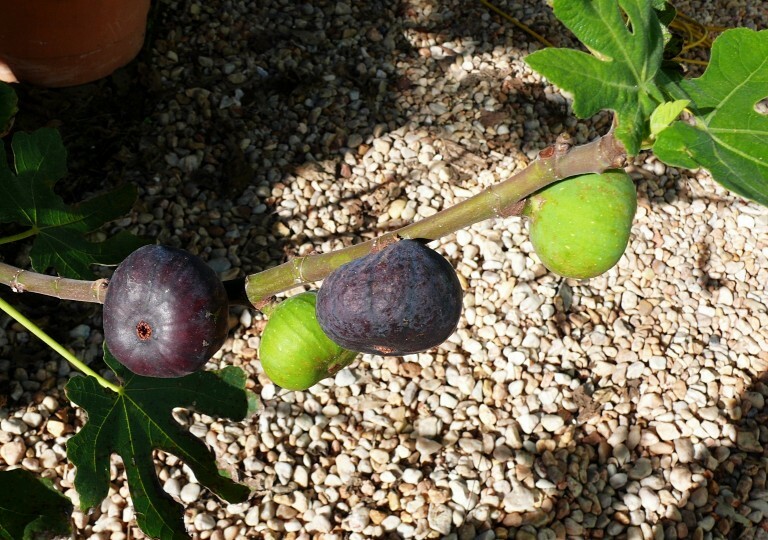 Comments: - This poor fig had a little accident. 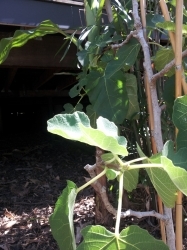 It was knocked off the deck that it was sitting on, and the top half of the plant was broken off. 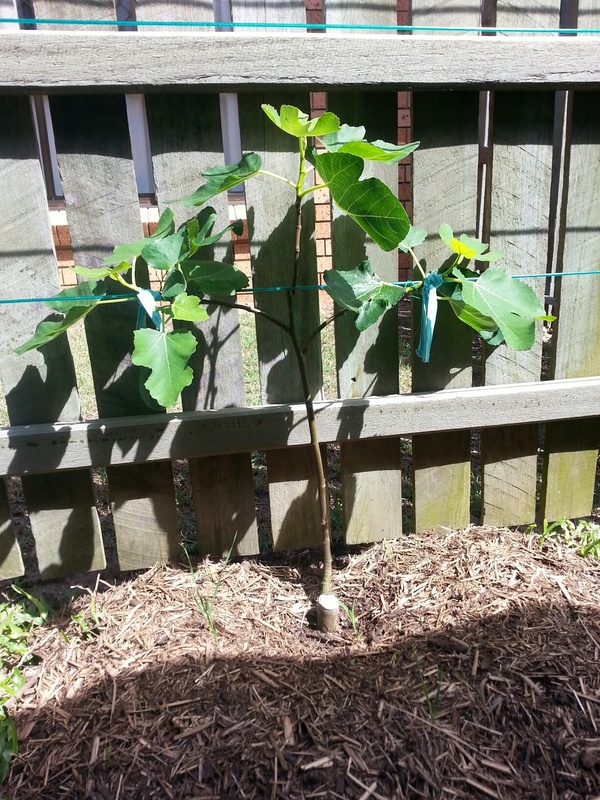 Despite that, the remaining little fig tree is doing amazingly. Plenty of new growth coming so quickly that I swear there are new leaves and branches every time I look at it. 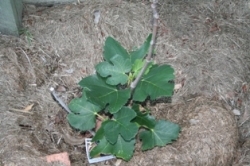 Hi wow the same thing has happened to my fig tree. The top of my plant fell off too wow how strange it's happened to both of us? 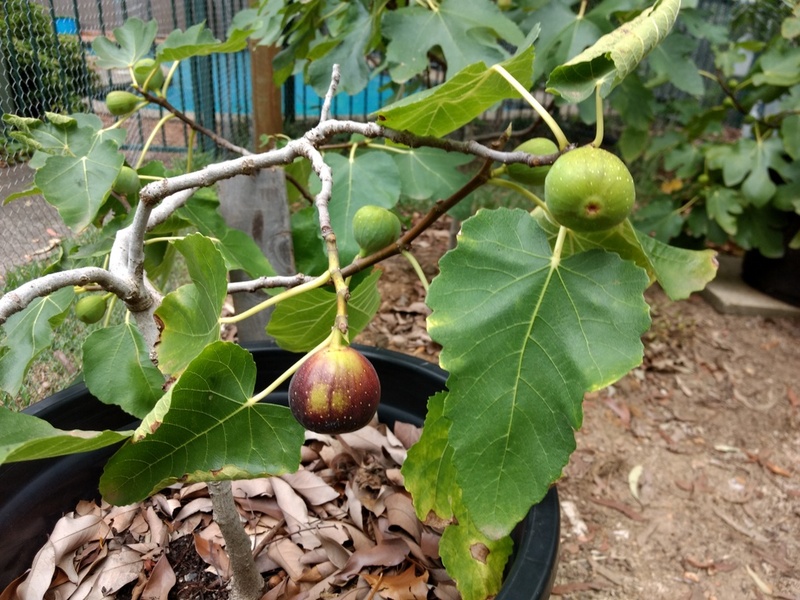 I think it's a luxury to pick and eat figs from your backyard, and I'd love to try making fig jam once the trees are big enough to provide me with surplus fruits. Other Comments: Great little tree. Low maintenance and good steady performer. Comments: - Bit slow growing, not sure why. 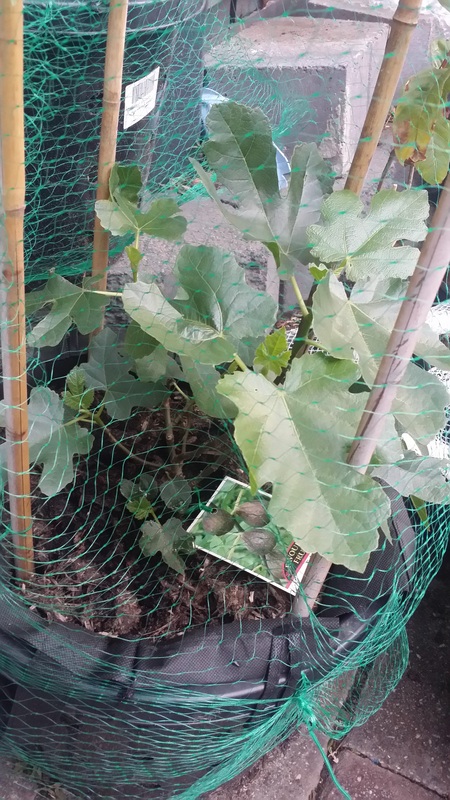 Productive tree , kept small in pot , sweet fruit , protect from birds . 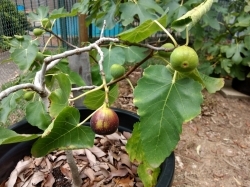 i grew up on these figs in Brisbane . Pest Control: fruit fly and birds , CDs and bird tape and bio oil . Comments: - Not as sweet as other varieties but still a good flavour. 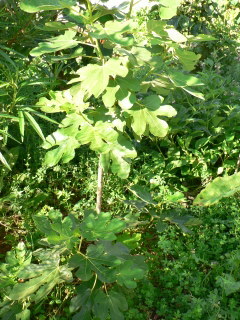 Only planted in October 2009 and seems a bit slow to take off though I see it is getting some new growth now. 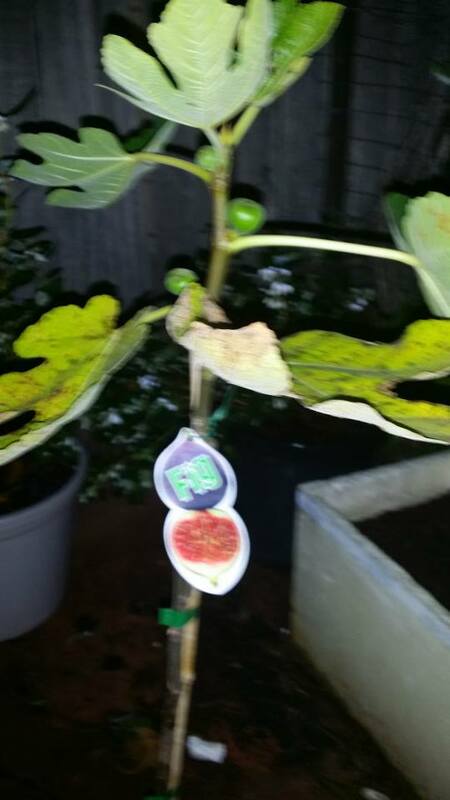 Had 3 figs on it but I removed them as they were bigger than the tree!! Took a little while to take off but is now showing good growth signs. Getting a little wind so will re-stake it with a stronger stake. Really taken off so am expecting good things this season. 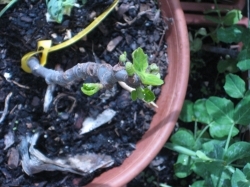 Took a cutting from a family tree last autumn and is now shooting out of winter slumber. 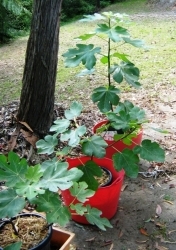 Plan to leave in a pot. Doing well in a large pot, haven't had it long. Started fruiting in spring but they shriveled and dropped off, I think it may have got too much rain. I need to move the pot to a spot with more summer sun and less rain. 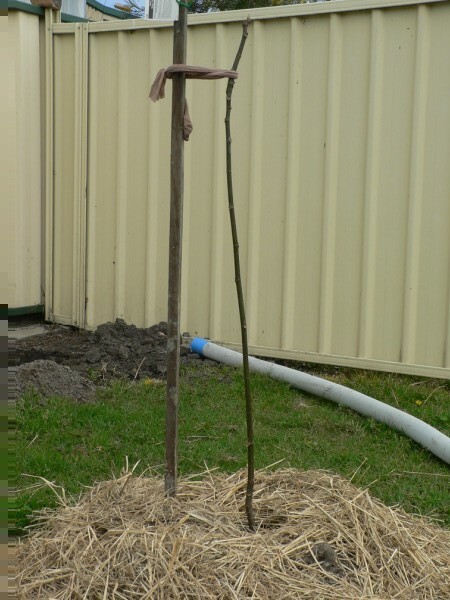 Neighbour has pruned the Jacaranda so this will now get full sun, I've chopped it down to about 30cm tall this winter because I want the branches much lower than they were. 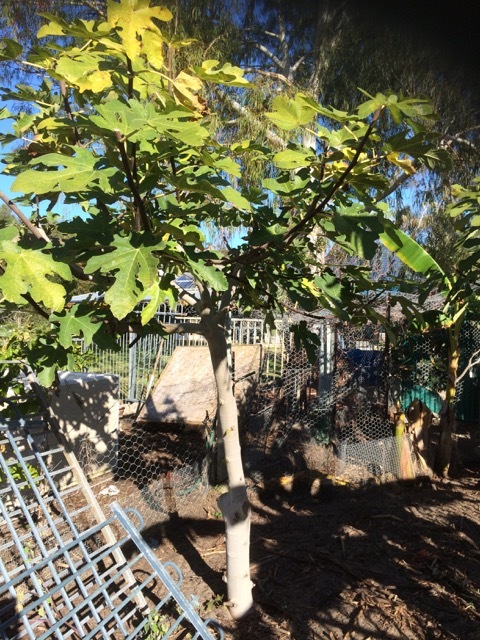 Comments: - I am attempting espalier along my side fence as a space saving technique due to limited room in my yard for full sized trees. Some new growth over the last week or so. Seems to be enjoying its new home despite not having full sun. Watering daily to get established after which hopefully minimal to no watering required. Comments: - Very vigorous plant. Absolutely no problems with it. Easy to care for. 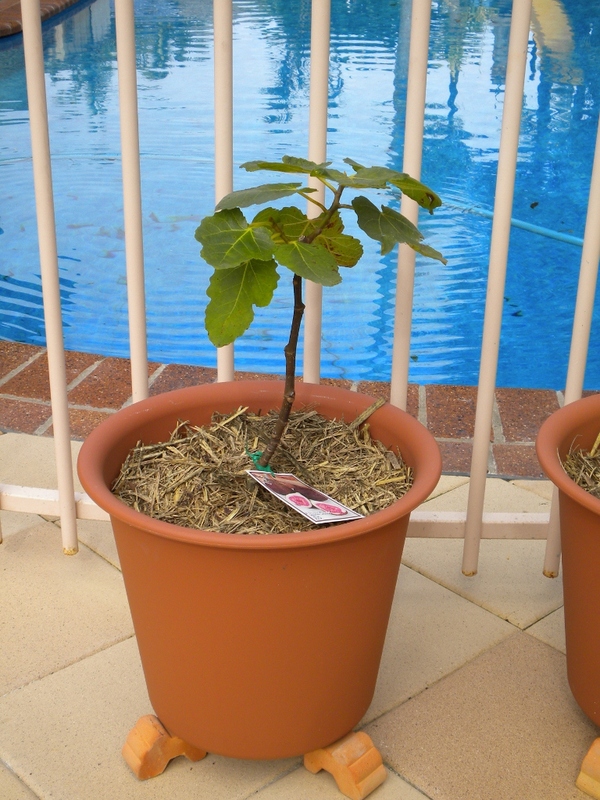 Love figs and ridicously expensive to buy from the markets, so i now have my very own!. 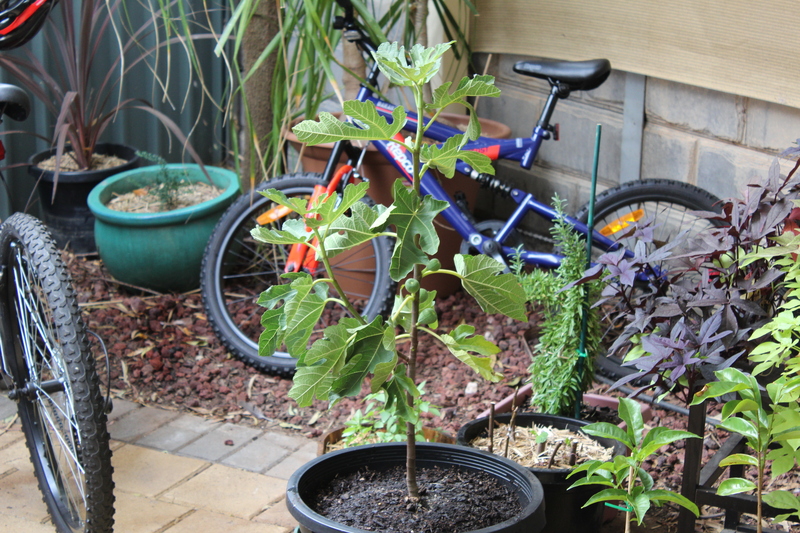 Have got a Black Genoa and white, plus a Brown Turkey fig. Both still small around 2 feet in height but my Black genoa has set fruit and growing nicely!!. 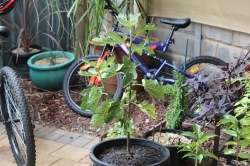 Very easy to grow and maintain, very hardy and suited for the Adelaide dry and hot climate. Pest Control: None - no pest. Comments: - Purchased from a local nursery during the winter and it started to suddenly come alive early September, 2016. Looking good so far with plenty of green foilage. We have had two crops within the first year. Love figs, thought id add some to my collection. My husband ran over it with the slasher. We had had 2 figs off the poor little thing. Planted winter 2009 close to a fence in full sun. Wanting to have some exotic fruit that you don't tend to buy. Interested in a very productive food garden, so getting lots of plants and seeing what flourishes. No sprays used. Most trouble is with birds eating the fruit. Not really sure when to prune or by how much. I am wanting to keep them small so I can net them more easily.